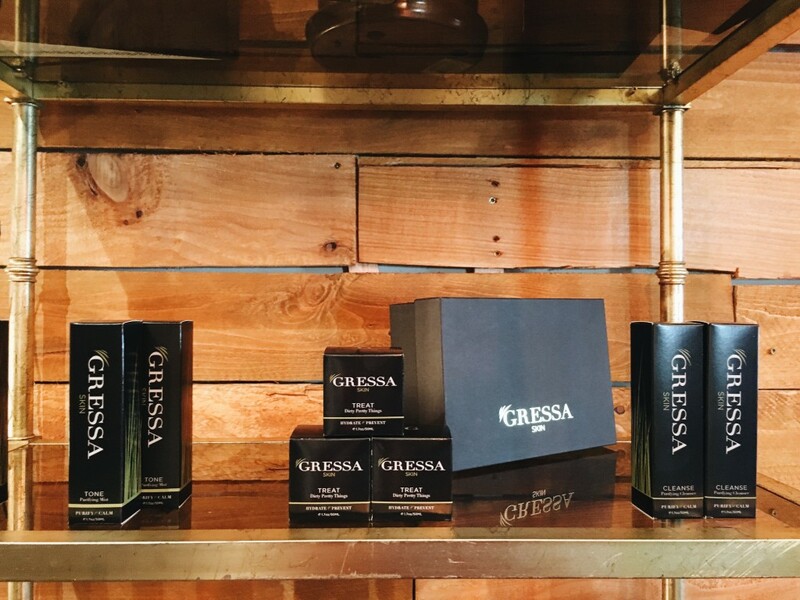 I was recently blessed with a trek to the rainy state of Washington for an internship interview and further blessed when I had extra time to drop by the recently opened Gressa Skin Lab in Seattle for a facial. 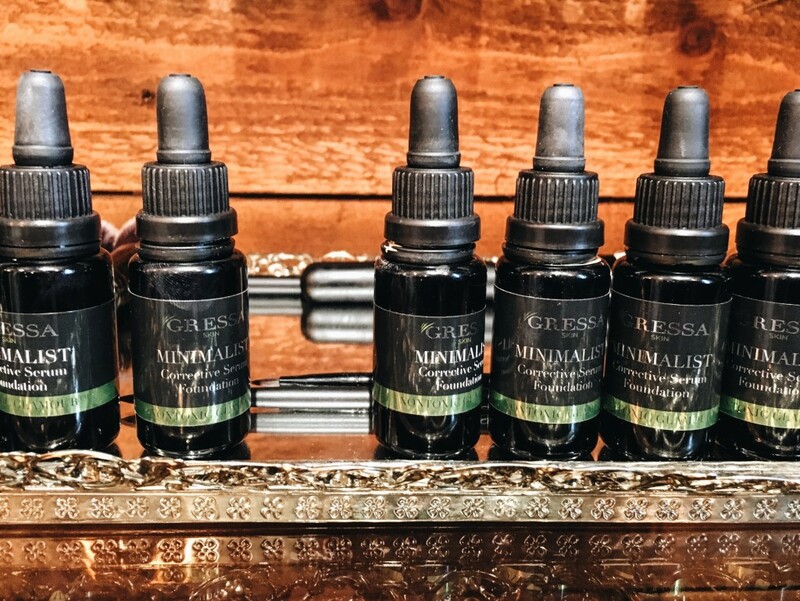 My gateway drug to Gressa Skin after A Night for Green Beauty in 2014 was the Minimalist Corrective Serum Foundation–a foundation with the slick of silicone (that broccoli seed oil, tho), the look of skin, the ingredients of a serum, and the finish of powder. Basically, super awesome. And collecting dust in my empties box. 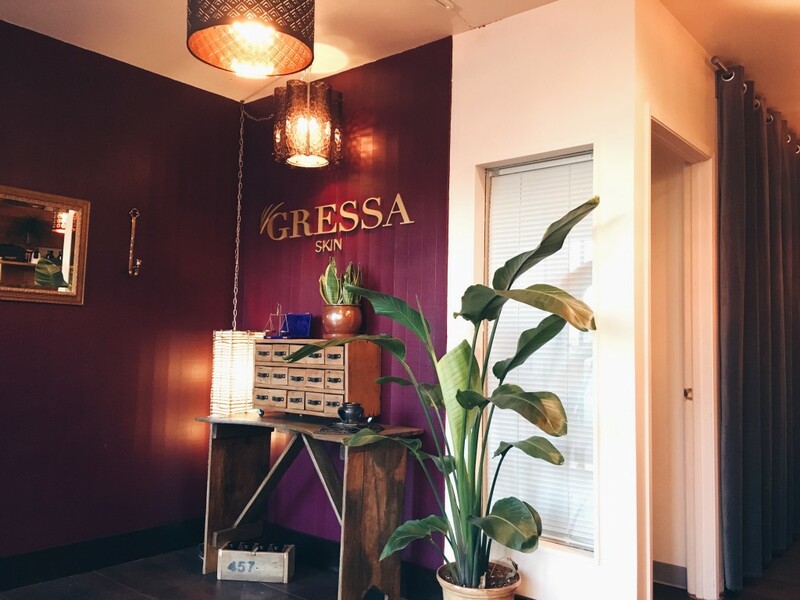 After a long morning of back-to-back interviews and non-stop talking, I had the most beautiful facial with Drey, the esthetician extraordinaire at Gressa. As I told him, since I foolishly neglected to pack a spray hydrosol for my trip, my skin was feeling super dehydrated from the flight and the hotel. Thankfully, my acne had been behaving, so I was more concerned about hyperpigmentation than pimple control. Drey started off with the Purifying Cleanser, followed by the Renewing Polish. The Renewing Polish is an exfoliating mix including honey and Vitamin C, but since it is quite thick in the jar, you’ll want to mix a bit of water into the formula on your palm/in a bowl before application (#protip). He left the Renewing Polish on for several minutes along with a steamer, before proceeding to do a few extractions on my nose, telling me to let him know if it hurt too much. After inspecting my skin, he noted that there weren’t too many extractions to do (whoohoo!) because it looked like most of my acne was the type caused from the buildup of dead skin cells, rather than excessive oil production (whoohoo! Sort of). I have been a bit lax with my exfoliating routine–I haven’t used a physical exfoliator for several months (oops). Instead, I’ve been using Tata Harper’s Resurfacing Mask as more of a chemical exfoliating treatment along with clay masks (primarily MV Organic Skincare’s Signature Mineral Mask) once or twice a week. The studies about colloidal silver turning people blue was a result of ingesting colloidal silver. And a lot of it. Of course they turned blue. Your skin can’t absorb molecules that are too big, aka it doesn’t fully absorb everything you put on it. Don’t read studies blindly while doing research–you should check what the study was for, who it was done by, etc. The facial includes an optional foot and leg massage without extra charge, but Drey asked if he could do a high frequency facial treatment instead. I thought that was a pretty good trade–plus I’ve never had one before. Basically, he used a little wand to shock my skin with little violet zaps to kill acne bacteria. Super freaky but super cool. Throughout the facial, he generously spritzed the neroli-filled Rejuvenating Mist (I had to ask afterwards how many bottles he goes through during treatments–I want to spritz my face like that all the time except I’d run out of toner in a week), massaged my skin and hands/arms/shoulders with magic fingers, draped my face in warm towels, and after 90 minutes, the headache I had from the nervous sleep the night before peeled away. He ended the facial with massaging in five drops of the Night Repair Elixir. He asked if I was using some form of retinol, and I said I was thinking about it (in the form of Marie Veronique’s Retinol Serum), and he recommended this oil which has something of around of 1% of Vitamin A in it along with clary sage and rosehip oil. It was super fun chatting to Drey about the products I was using, my skin history, and Gressa Skin in general. 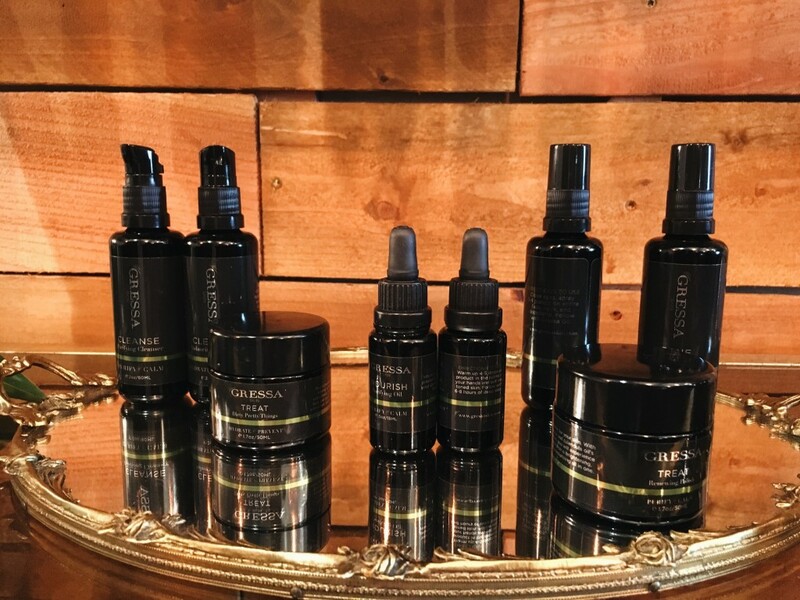 Did you know that Svetlana, the founder/owner/beauty/brains of Gressa, is a chemist and spends years formulating products? Spoilers: Svetlana’s been working on a Vitamin C Serum for several years now. More Vitamin C was something my last facialist several months ago recommended, and my skin loved the last Vitamin C I used (YÜLI Liquid Courage), so basically, I want need. I have had the joy of facial’ing at several #greenbeauty treasures including Pratima Skincare in NY and International Orange in SF, but surprisingly to me, the estheticians hardly recognized the products I was using. I was more surprised at IO, since many of the products I mentioned were literally a walk down the street at Credo Beauty. 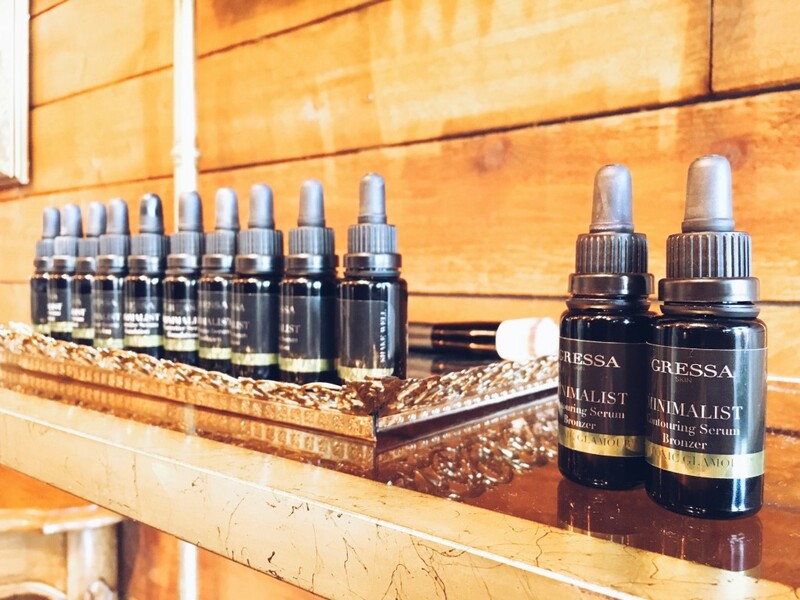 It makes sense since the estheticians probably have a set group of products they work with, but it was refreshing that Drey was in the know with the #greenbeauty world and that we could talk product. We also talked about our dislike for brands that have 45 millions products directed towards a multitude of seasons or skin types but the difference is just one essential oil. 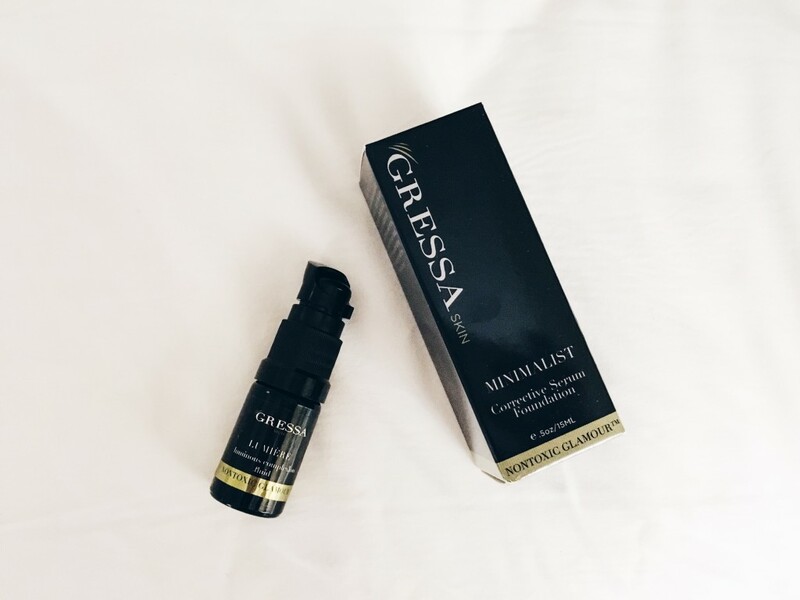 Gressa, on the contrary, is formulated with all skin types in mind, which is why Svetlana dubs it a minimalist line. I would concur (though there are two separate-ish lines for more mature skin vs. acneic skin). Afterwards, he brewed us a pot of Gressa’s beauty tea (mix of rooibos and flowers soon to be offered) while I pittered and pattered about. I had been holding off on trying Lumière, the broccoli seed-based blush, so after applying some of the foundation in 3 (had to look good for the massive amounts of dumplings I was going to eat later at Din Tai Fung), I tried on some of Amelia, the coral shade. Drey gave me the tiniest amount out of the teeny tiny bottle, which was plenty to give both cheeks and a hand a flush that’s super similar to my natural blush. Sold. He also let me play with the soon-to-be-released Eye Tints, which I wanted to walk out with. There will be three colors (for now): a champagne-ish gold, a coppery brown, and a deep plum. The texture is really similar to the Lip Boosts, about which I complained a bit regarding the super hard texture. The reasoning: Svetlana didn’t want a formula that would just slide and melt off, which I can respect. But you really have to dig into those pots when you’re warming up the formula. 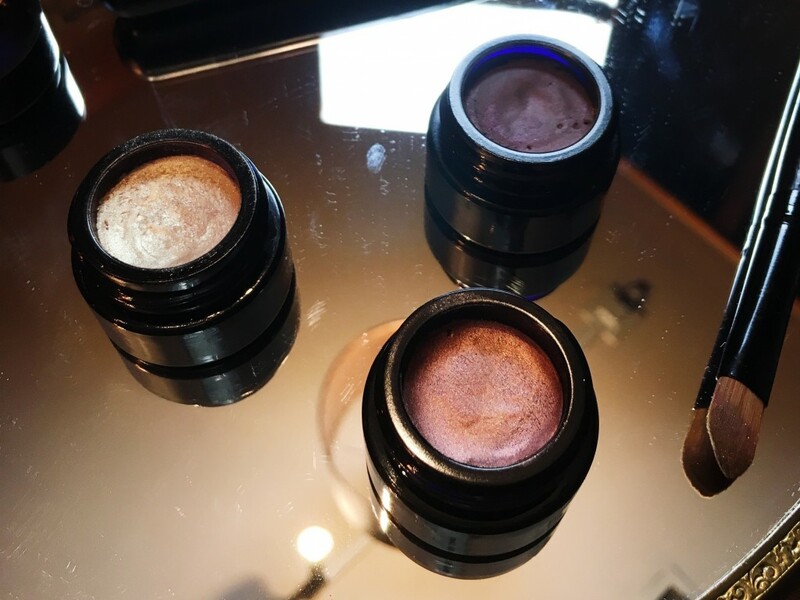 The gold shade, which may remind you of rms beauty’s Solar, has sparkle, but it’s like tiny little beautiful sparkles with a cooler, champagney, sort of silvery undertone. The coppery brown is sort of like a lighter and slightly redder rms beauty Seduce. I first mistook the deep purple as a deep brown so once Drey noted it was a purple, I didn’t try that on my lids since I already layered the gold and the coppery brown, but it looked more matte in the pot than the other two shadows. I applied the shadows with the brush pictured for the sake of not dipping my grubby hands in the pot, which took some effort to get color on the brush but did the job. I of course walked away with Lumière Luminous Complexion Fluid in Amelia along with a repurchase of the foundation in 3. I do currently have two (not even just one) shades of the Kjaer Weis foundation, but I figured it couldn’t hurt to rotate two great foundations…right? Right. Since Renewing Polish was out of physical stock and Drey recommended it be something I use two to three times a week, I ordered that and a lighter shade of the foundation after I got home, having forgotten that I’m not my summer shade anymore (oops). The Night Elixir is on my to-buy list, perhaps when I get lower on my Vintner’s Daughter. So how was my skin right after and how is my skin looking a week later? Afterwards, my skin was baby, baby smooth. I was glowing like crazy, which is to be expected after an oil massage following a top notch facial. Though since my skin went under some duress, i.e. all of the massaging, exfoliating, masking, tapping (Drey at some points tapped my skin and complimented my elasticity. I was cracking up in my head, because I’m in my 20’s, and my skin better have good elasticity), I tried to be as gentle as I possibly could when washing up for the night, and I went comfortably makeup-free for the next few days (perks of three-day weekend). Unfortunately I came back to a really stressful week which came with a few stress pimples, plus it rained a few times which mean my neck had a few pimples from my muddy bike helmet (ugh). I don’t want to massage results (ha ha) and say that my skin is a million times better and I’ve conquered acne for forever, because it’s totally reasonable given my environment that I’ve got some pimples and besides, skin refreshes every 30 or so odd days. But I have gotten compliments on my skin, and the texture is pretty darn smooth, if I have to say so myself. Drey mentioned a lot of people stop by who know the brand from online, so tell me, have you had the chance to visit yet? If not, what are your favorite products from the line or what are you looking to try? tl;dr If you’re ever in Seattle, you know where to go for a good facial, a good conversation, and a great massage all in one place. A+ would do it again. Disclaimer: I purchased the facial and products mentioned above myself, though Svetlana and Drey graciously gave me a discount (though I tried to tip some of it back because the dude seriously earned it). I was not asked to write a review nor was I offered compensation for writing about the facial. Affiliate links are included. Heh, I do my best 😛 Shades can be tricky–def recommend emailing them for recommendations. It turns out that shade 1.5 is a great match for me–3 is just a bit too tan (save that for the summer) and 2.5 is a little pink. Shade 1.5 is like the yellow version of 2.5, which is a bit unintuitive. If I’m ever in Seattle, that’s a must go place on my list. I miss when Gressa was in Beaverton. I love their foundation. Since I’m a make up junkie, I try other foundations (probably always will), I still come back to Gressa. I bought Elise and got a sample of Amelia and I love both of them. But I think Amelia looks slightly better on me. But the teeny sample is lasting me forever and the bottle of Elise will last a life time. LOL. I’m so glad you wrote a review on their facial and happy that it was a success! The space does look so pretty and her makeup looks great. I think for me the story just reads too May Lindstrom even down to the spices in the mask to the way Instagram captions are written. Laurel is guilty of this as well, where they seem to just rip blatant pages from May Lindstrom’s spirituality and Yuli’s formulas. I find it all kind of annoying. Your experience sounds so luxurious! I’ve never had a facial before but this totally makes me want to book an appointment. I had time to visit their Portland boutique but I’m dying to see their new Seattle location. Wait wut. Gurl, we should hang sometime and have a shopping party at Credo–I’m an hour and change away from SF. Also, they have founder events on Thursdays sometimes. !! I go there for work every week and rarely have time to actually get lunch (sad, I know, haha) before I have to get on the road to beat traffic, but one of these days I can stay a little later and we can have a hang sesh!! Thanks so much for the awesome info! I’m always on the look out for great skin care advice. Have you or anyone heard of a company called Herban Nectar? I’m hearing a lot of buzz about them as far as organic skin care goes but I think they may be new so i’m not finding them on any of these lists. I love trying new skin products but I’d prefer to see some reviews about it first. The website is http://www.HerbanNectar.com if anyone can give me some insight I’d appreciate it!